Syrian refugee children draw in their notebooks in a refugee camp in Turkey, August 2017. Despite Turkish leaders’ frequent insistence that Syrian refugees will return home, privately, they seem to be preparing for the likelihood that most will remain permanently. Turkish identity has a clear ethnic and religious coloration. However, this is sufficiently blended with the concept of citizenship that most Sunni Muslims who are willing to do so can easily assume unfettered Turkish identity over time.7 The great exception has been the Turkish Kurds. While they are overwhelmingly Sunni Muslims and hold Turkish citizenship, many—probably most—resist assuming Turkishness as their primary identity. In large part, this is because they have a clear ethnic identity as Kurds: a distinctive language, a geographical area of concentration within Turkey, and, most important, a sense of common destiny. They also have a sizable population in Turkey, which strengthens their ability to resist Turkification, psychologically and politically. Like Kurds, Syrian Arabs are Sunni Muslims but are ethnically, linguistically, and, arguably, culturally distinctive from Turks. Should they remain in Turkey in significant numbers, like Kurds, they will probably feel less pressure to integrate than have other, smaller Sunni Muslim groups over the years. While most Turks hope all the Syrians will eventually return to Syria, that prospect looks unrealistic; sizable numbers of Syrians are indeed likely to remain. The issue of their remaining is politically explosive in Turkey, and the Turkish government has been hesitant to acknowledge publicly that it foresees the long-term integration of the refugees into Turkish society. In fact, bowing to public sentiment, Turkish leaders often proclaim that all Syrians will ultimately return to Syria, and they are likely to express this sentiment repeatedly as March 31 nationwide local elections approach. Yet, whether by default or by design, the government seems to have begun gradually implementing a policy of integration, suggesting that, regardless of their public declarations, Turkish President Recep Tayyip Erdoğan and other key leaders realize that many Syrians are in Turkey to stay. Ultimately, Turkish society may view integration as necessary for social harmony and recognize that, if integration is to be successful, it must be pursued as early and thoroughly as possible. Turkey’s future stability may depend on such decisions. The Syrian refugee crisis in Turkey is as old as the Syrian civil war. The first group of 252 Syrian refugees arrived in Turkey in April 2011, just weeks after Syrian President Bashar al-Assad’s response to anti-regime demonstrations throughout Syria turned violent. At that time, Syrians could enter Turkey without a visa,8 and Ankara soon announced it would pursue an open-door policy for the refugees.9 In effect, any Syrian who made it to Turkey, through any means, would be welcome. Finally, in October 2011, the Turkish government announced that the refugees would be given “temporary protection” status. Turkish leaders initially thought the refugee flow would be limited and temporary. By the end of 2011, Turkey was hosting just 8,000 registered Syrian refugees, and several thousand had returned home after the situation in Syria briefly appeared to stabilize.10 In mid-2012, however, a collapse of ceasefire efforts and surge in fighting triggered a torrent of refugee arrivals that would continue for nearly four years.11 In August 2012, Turkey said it could take no more than a total of 100,000 Syrians. Yet by October, the number of refugees had surpassed that once-unthinkable mark.12 The number of newly registered Syrian refugees in Turkey—which includes arrivals plus births in each respective year—was roughly 140,000 in 2012, 412,000 in 2013, 1,062,000 in 2014, and 881,000 in 2015.13 By then, it was abundantly clear that the flow was neither limited nor temporary. As part of the October 2011 temporary protection regime, Ankara pledged that it would welcome all people crossing the Syrian border to seek safety in Turkey, that it would provide for their humanitarian needs, and that it would not force any such people to return against their will30—this last point a bow to the well-known Geneva principle of nonrefoulement. Turkey largely honored these pledges until it became overwhelmed by the large number of Syrians and by a breakdown in security in the middle of the decade. Another potentially important difference is that under Article 11 of the TPR, Turkey reserves the right to terminate the temporary protection regime collectively or, under Article 12, individually. Thus, theoretically, it seems, Turkey could send the Syrians back to Syria at any time, notwithstanding its pledge of nonrefoulement—and, in many individual cases, it has done just that. In sum, by its national law, Turkey is obliged to admit non-Europeans who fit the Geneva definition of a refugee, but it accords them fewer rights than those inherent in full-fledged refugee status, since it does not apply the 1951 Geneva Convention to them. In any case, a commitment based on national law rather than international obligation, is inherently easier to change and therefore less binding. Few Syrians intend to leave. According to a 2017 survey, 61 percent of Syrian refugees say that they would return only if the war ended and a “good” regime were in place in Syria; another 16 percent say they are “not thinking to go back at all.” Meanwhile, 13 percent say that they would return at the end of the war, no matter what type of regime is in place. And only 3 percent say they will return even without an end to the war.37 When asked about their preferred status in Turkey, more than two-thirds of the refugees said they either wanted dual Syrian-Turkish citizenship or Turkish citizenship only.38 With little prospect for the emergence of a Syrian regime that would tempt most refugees to return, the Syrian refugees and their descendants are likely to be a major presence in Turkey for years to come.39 This is certainly the case to the extent refugee preferences predominate. It is difficult to persuade people to resettle in a war-devastated area. Returning Syrian refugees would face many daunting prospects in their homeland, starting with the challenges of finding a place to live and earning a living. Hospitals, schools, and basic services throughout much of Syria have been destroyed or are nonfunctional. There is also the possibility that the Assad regime or opposition groups will seek to exact revenge against male former refugees for fleeing, rather than staying and fighting. In October 2018, President Erdoğan claimed that, since 2016, up to 320,000 Syrians had already resettled from Turkey into areas of northwestern Syria occupied by Turkey and pro-Turkish militias.45 Many experts are skeptical of Erdoğan’s claim.46 However, even if it is fully accurate, it would reduce the Syrian population in Turkey by less than 10 percent, leaving more than 3 million Syrians in Turkey. Even with an unlikely return to stability and the establishment of a safe environment in Syria, it would be difficult for Turkey successfully to locate, round up, and force millions of Syrians to return against their will. It would require enormous resources, and Turkey quite possibly would face international opprobrium were it to do so. Moreover, hundreds of thousands of unregistered refugees would be virtually impossible to find. When President Erdoğan raised the prospect of granting Syrian refugees Turkish citizenship in July 2016,53 public pushback was strong.54 Opposition parties objected, convinced that Erdoğan saw the refugees as a potential source of future political support, but even many of the president’s own supporters opposed the idea. Overwhelmingly, Turks just wanted the refugees to return home. President Erdoğan has been inconsistent on the issue of citizenship for Syrian and other refugees.57 Erdoğan’s July 2016 call for citizenship seemed to apply to all the Syrian refugees. But in January 2017, he specified that he wanted citizenship, following careful vetting by the Ministry of Interior, for those Syrian refugees with skills that would benefit Turkey—“highly qualified people … engineers, lawyers, doctors. Let’s make use of that talent,” he said. “Instead of letting them work illegally here and there, let’s give them a chance to work as citizens like the children of this nation.”58 This approach more or less describes current policy. The decision to grant citizenship in limited numbers, however, does not begin to resolve the fundamental questions about the future disposition of Syrian refugees in Turkey. First, Turkey must determine whether to acknowledge that the vast majority of Syrians will likely remain in Turkey and, if so, it must consider how to integrate them into wider Turkish society. Given the size of the Syrian refugee community, its lack of obvious alternatives to Turkey, and the potential consequences for Turkey of ignoring the problem, efforts at integration appear to be Turkey’s only logical solution. Failure to integrate the Syrians could create new divisions in Turkish society as well as deepen pre-existing economic, religious, and ethnic divisions. Granting citizenship in its current, limited scope and pace would likely have little impact on the problem, but there can be meaningful steps toward integration that do not involve mass conferral of citizenship. A September 2012 Metropoll survey found that 52 percent of Turks initially disagreed with the decision to allow the Syrians into the country, and 66 percent said additional refugees should be turned away.71 At that point, there were only about 80,000 Syrian refugees in Turkey, mostly in camps far from major Turkish cities. By contrast, there are now 50 times more, spread across all 81 provinces.72 Perhaps unsurprisingly, these negative attitudes have only intensified. Terrorism associated with the Syrian civil war reinforced and deepened public unhappiness regarding the refugees. The May 2013 bombing of Reyhanlı on Turkey’s southern border, which left 53 dead and dozens wounded, may have been an early turning point. Reyhanlı, just 3 miles from Syria, had a significant refugee presence.73 The source of the bombing was not clear; the Turkish government arrested several Turks with alleged ties to Syrian intelligence.74 But, for most Turks, the important fact was that the attack was clearly linked to the Syrian war, illustrating that Turkey’s support for the Syrian opposition and welcoming of refugees could have deadly consequences inside Turkey. Around the time of the Reyhanlı bombing, large numbers of Syrians were also beginning to move from the camps near the border into urban centers across the country. This brought large numbers of refugees face to face with Turks for the first time, and these encounters seemed only to increase Turkish resentment. In 2014, significant anti-refugee protests broke out in the Turkish cities of Gaziantep, Hatay, Urfa, and Kahramanmaraş—all of which hosted significant numbers of Syrians.75 According to scholars Bezen Balamir Coşkun and Selin Yıldız Nielsen, tensions were fed by the view that Syrians contributed to “low wages and dire working conditions, drastic increases in rent prices, and an increase in petty crime in urban areas where the asylum seekers had settled intensively.”76 Most of these complaints—especially those related to economic conditions—have persisted over the years. Following the Reyhanlı bombing and a spate of other terror attacks in 2015 and 2016, Turks increasingly began to associate refugees with violence—not necessarily because refugees themselves were perpetrators but because the refugee flow seemingly demonstrated that Turkey had lost control of its southern border, allowing the ill-intentioned to enter with the genuinely needy. After the Reyhanlı bombing, protestors had denounced jihadists, who seemingly could go back and forth across the border at will.77 In January 2016, an Islamic State-affiliated Syrian refugee, legally registered in Turkey, staged a suicide bombing in Istanbul’s Blue Mosque tourist district, killing 10 tourists and wounding more than a dozen others.78 Not long thereafter, Turkey began to take stern measures to tighten border control, as discussed earlier. Asked in another recent poll about their government’s overall policy on Syrian refugees, 72 percent of Turks disapproved, including 56 percent of AKP voters. Just a year earlier, another poll reported a somewhat lower level of disapproval: 62 percent of Turks overall and 45 percent of AKP voters.88 The trend is clear. With the public’s increasingly negative perception of refugee policy and of the Syrian refugees themselves, the Turkish government probably deserves credit for having advanced integration—or harmonization, in the government’s preferred term—to the extent that it has. Many experts have urged Turkey to adopt a clear and comprehensive policy of integration, proposing, for example, a right for refugees to live and work anywhere in the country without the need for work permits; a strengthened mandate for municipalities, which are closer to the needs of their respective refugee communities; educational remediation opportunities and vocational training for the hundreds of thousands of Syrian refugees who missed out on schooling entirely in the early years of the crisis; and a public education campaign directed toward Turkish citizens to combat misperceptions about refugees.89 These are all good ideas that take into account the political reality that many Syrian refugees are likely to remain in Turkey and must be integrated for the sake of Turkey’s social harmony, while recognizing that blanket naturalization is not in the cards for the foreseeable future. Even as Turkish politicians pledge to voters that all the Syrians will return home, the Turkish government seems to be tentatively pursuing measures that foster coexistence between Turks and Syrians and begin to integrate the refugees into Turkish society. Indeed, the government’s actions suggest that Turkish leaders are preparing for significant numbers of Syrians to remain in Turkey indefinitely, as the ombudsman report suggests will happen. As previously mentioned, the refugee camps are being phased out, and Syrian students are being integrated into Turkish public schools. Meanwhile, Syrians are being integrated increasingly into the Turkish economy. These steps may be deliberate, signaling the government’s recognition that a sizable number of refugees and their descendants will remain in Turkey and that, therefore, integration is the best long-term policy. On the other hand, the government simply may view these measures as the best of bad alternatives available at the moment—less costly or more efficient than striving to keep the Turkish and Syrian communities fully separate. If the former is true, it could be considered integration by stealth—a low-key approach made necessary because integration runs counter to the thrust of most public statements coming from Turkish leaders. This would not reflect a full-blown policy of integration, since there is much more that can be done to integrate the Syrian community, as noted above, but it may be all the integration that the political traffic will bear for now. In any case, by closing refugee camps and encouraging refugees to live in Turkish society; by opening the economy to the refugees, however haltingly; and by educating the refugees as Turks, the government has inarguably taken important steps in the direction of integration. The move to close the camps was heavily influenced by the experiences of the 96 percent of refugees living outside the camps all over Turkey. Economically, Syrians have managed surprisingly well outside the camps, if not without many difficulties, and, overall, have contributed to the Turkish economy. In 2016, the Turkish government announced a work permit system to tackle the Syrian employment problem, but the program is not popular, and, as noted, only about 32,000 Syrians have received work permits to date. Syrians face a number of obstacles and disincentives when applying for work permits. First, to acquire a work permit, they must work in the province in which they are registered as under temporary protection.107 Since registration is required within 10 days of arrival in Turkey, however, this province is usually the one where the refugee entered Turkey.108 Therefore, refugees are disproportionately registered in the provinces bordering Syria, while the jobs tend to be elsewhere—in big cities in western Turkey, such as Istanbul, Izmir, and Bursa. These destinations are naturally where many of the refugees go and work, regardless of registration, but they do so as part of the underground economy. The Turkish educational system is essential to the integration of the Syrians into Turkish society. In its most remarkably pro-integration decision to date, the Turkish government seems to have made a decision to use this system to the fullest: Soon, all Syrian students will attend Turkish public schools. Whatever the challenges, the decision to discontinue the TECs and absorb the Syrians into Turkish schools seems to be an acknowledgement that the Syrian presence in Turkey likely will be permanent. Moreover, by acculturating Syrian students, it will tend to reinforce that permanence. The implications of this decision for the long-term integration of Syrians into Turkish society are potentially immensely positive. Should Turkey fail to integrate its Syrian population effectively, it would likely face profound social consequences, some of which are already visible. For example, the hundreds of thousands of school-age children who missed out on education entirely may struggle to compensate for that loss as adults and perhaps will not always pursue societally healthy paths in doing so. Turkey’s more recent efforts at educating the refugees, estimable though they are, do not ameliorate the situation of this “lost generation,” which might come to form a permanent, resentful underclass in Turkey.123 The Syrian refugees arrived in Turkey at a significant educational disadvantage. Of those who arrived through 2015, an estimated one-third were illiterate, and another 13 percent were literate but self-taught.124 Meanwhile, Turkey has largely conquered illiteracy in its own society.125 This educational gap has probably contributed to the tensions that have developed between Turks and Syrian refugees. Given the size of the Syrian community in Turkey and the potential for violence, it is clearly in Turkey’s interest to avoid such an outcome. Ankara’s current approach of simply tiptoeing toward integration is politically understandable at this moment, especially with popular feelings running against the refugees and with local elections fast approaching, but it is likely to prove inadequate over the long run. Considering the dramatic scale of the refugee issue, it is surprising that it has not proven more disruptive in the political arena. Crude analysis of the June 2018 parliamentary elections suggests that the refugee issue had, at most, minimal impact on the results. The AKP lost seats relative to its performance in the preceding November 2015 election, but these seats were lost proportionally nationwide. The party performed no worse in provinces where the refugee issue seemingly would have loomed largest—provinces with the highest refugee populations, those with the highest concentration of refugees,135 and those most reliant on the seasonal agricultural work that has been largely captured by underground Syrian workers136—than it did nationwide.137 If the refugee issue indeed was a factor in the AKP’s decline, it was a factor evenly distributed throughout the nation, lacking disproportionate wallop where it would be most expected. Could the refugee issue yet explode and have an impact on the nationwide local elections scheduled for March 31, 2019? Two separate January 2019 polls yield conflicting evidence. To the question of Turkey’s biggest problem, one poll puts the refugee issue at a microscopic 2 percent,141 the other at a surprisingly large 13 percent—more than sixfold larger than the result in the rival poll and more than threefold the number from the summer 2018 survey cited above.142 Time—and perhaps the March 31 elections—will tell if public concern about the refugee issue has genuinely increased in a dramatic and enduring fashion, or if the latter survey is simply an outlier. Turkey hosts the largest number of refugees in the world,144 and it has spent generously on their behalf. Ankara provides free health care and education to the refugees as well as full services for the hundreds of thousands of Syrian refugees who have come through, or still live in, refugee camps sprinkled around the Turkish south. As part of this aid program, the European Union funds two major direct assistance programs for Syrian refugees in Turkey: the Emergency Social Safety Net program, which provides support to needy Syrians and their families—more than 1.5 million people, as of January 2019—and the Conditional Cash Transfer for Education program, which provides funding to families who send their children to school and is paid out on a per-student basis, to parents of 410,000 students, as of January 2019. 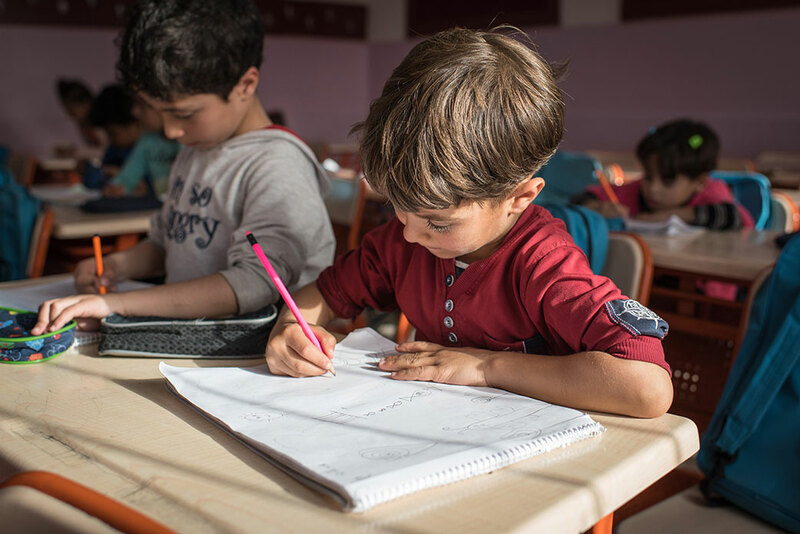 The latter program is intended to incentivize parents to send their children to Turkish state schools.149 Both programs are implemented by Turkish agencies, which may contribute to the many Turks’ misperception that Turkey is funding those programs as well. In early January 2019, the AKP’s Istanbul mayoral candidate Binali Yıldırım pledged that the refugees’ presence would not be permanent and menacingly promised that there would be “zero tolerance” for Syrian lawbreakers, saying, “We’ll grab them and throw them out by the ear.”154 Istanbul hosts by far the most Syrian refugees of any city or province in Turkey, with more than 550,000 registered.155 The harsh attitude struck by the governing party’s candidate for the most important mayoralty in the nation—the job that launched Erdoğan to national leadership—almost certainly will set the tone for the AKP’s candidates in other localities. The nationwide elections in March will likely be the final electoral test for the AKP and its rivals for several years, with the next presidential and parliamentary elections scheduled for 2023. Whatever the outcome of the election, Turkey is in a race against time to employ, educate, and socially integrate the Syrian refugees. As the Turkish ombudsman’s report cited earlier suggests, doing so serves the interest of social peace, benefiting Turkish citizens and Syrian refugees alike. Moreover, the Syrian refugee crisis could be a harbinger of future challenges. For several years now, Turkey has been classified by the World Bank as an upper-middle-income country.156 It is certainly wealthier, more stable, and, even in its increasingly authoritarian state, freer than many Muslim-majority countries to its south and east, making it a magnet for increasing numbers of refugees and asylum-seekers throughout the region. Therefore, the challenge of integrating a large population of refugees may be a continuous one. If Turkey is to find a workable formula for facilitating effective integration, it needs to start developing, funding, and implementing that formula as soon as possible. Alan Makovsky is a senior fellow for National Security and International Policy at the Center for American Progress. The author wishes to express appreciation to the following individuals for conversations and/or email communications that added immensely to his knowledge of the issues discussed here: Laura Batalla, Murat Erdoğan, Nigar Göksel, Selin Yıldız Nielsen, Güven Sak, Sabri Sayari, Selin Ünal, and two anonymous Syrian refugees living in Turkey. The Center for American Progress thanks United Minds for Progress for their support of our policy programs and of this report. The views and opinions expressed in this report are those of the Center for American Progress and the author and do not necessarily reflect the position of United Minds for Progress. The Center for American Progress produces independent research and policy ideas driven by solutions that we believe will create a more equitable and just world. Author’s note: All Turkish proper nouns are rendered with Turkish spellings, except the name of the country Turkey and the familiar cities Istanbul and Izmir.